The cocoa business was not their plan. Anne Jordan Reynolds was a human sexuality professor at Auburn Montgomery, and her daughter, Stephanie Reynolds, was being encouraged to become a lawyer like her father. But vacation time in Haiti when Stephanie was just 16 took them to a place of not only beautiful waters and people, but later, opportunity, culture and a commitment to help rebuild a ravaged community. From the first vacation a dozen years ago, the two Montgomerians helped open a school in a Haitian village called Cocoa Beach. From there, the mother and daughter began to realize the needs in Haiti went far beyond education. The country needed economic growth, and after Anne Reynolds spent hours researching the types of agriculture needed to sustain the community, she and Stephanie settled on vanilla, which grows on cacau trees. From there, they began to turn the cocoa beans, which also are grown on cacau trees, into chocolate. And today, they have created a self-funded business, De La Sol — which they said means “From the Soil” in French. The business is the first and only exporter of Haitian cocoa. 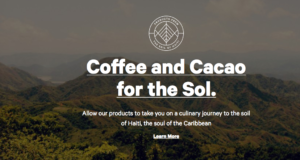 The company, located in Plaisance, Haiti, primarily sells cocoa butter to the women in Haiti, with a large part of the cocoa powder produced sold to Taharka Brothers, an ice cream business in Baltimore, Maryland. The two are focused on creating jobs in Haiti, with Stephanie Reynolds even dedicating her graduate studies in African-American Caribbean studies from Tulane to creating a sustainable model of small business in the Caribbean country. Today, the two split their time between Haiti and Montgomery, working with more than 650 cocoa and vanilla farmers. In 2013, they expanded, opening the first cocoa processing facility in northern Haiti, where the women employ eight people who process the cocoa beans into cocoa butter and cocoa powder. After convincing a vanilla agronomist to move from Costa Rica to Haiti in 2004, they planted 200 vanilla plants, and in 2011 distributed 70,000 vanilla vines to a farmers cooperative in Haiti. “It’s magical,” Anne Reynolds said of Haiti and why she and Stephanie continue working there. “It’s the people, the culture. It’s extended family. It’s the sense of community that oftentimes we don’t have here with the disconnect of texting, cellphones. There, it’s community. It’s face to face. You spend most of your day engaging that way. The Reynoldses agree there has been a big movement in Haiti since a January 2010 earthquake left 220,000 people dead and another 300,000 injured. The two arrived the day of the earthquake — on a regularly planned trip. Asked whether the De La Sol business can be created in Montgomery, Stephanie Reynolds said the business first must increase its production levels. “Right now, we’ve exceeded our capacity with our equipment that we have,” she said. “We’ll be expanding this year and talking to some investors in Haiti to help us grow. In order for it to really be sustainable, we’ve got to produce in larger volumes before it makes sense for us to be exporting here on a larger scale. While the business was initially self-funded, they are exploring bringing in investors to help them grow. They will start making chocolate bars next month, and Stephanie Reynolds, who travels back and forth the most, will begin spending more time in Haiti once that production begins. And sharing it all back home is something both agree is important. “So many people here, when they think of Haiti, they think of poverty, they think of the earthquake, destruction, corruption,” Stephanie Reynolds said. “But I love sharing with people the history of Haiti, the culture, the beauty.